The first exams in the new Leaving Certificate subject of politics and society got a vote of confidence from teachers and students. Around 880 candidates, from 41 schools where the subject has been piloted, sat the inaugural exams. It was a marathon 9.30am-8pm day for some, because the addition of a new subject to the timetable meant three exams for those who were also sitting physics and design and communications graphics (DCG). Candidates entered for both DCG and politics and society sat the former in the afternoon, and remained under supervision until they started the other exam at 5.30pm. The politics and society papers covered a spectrum of topics that included the proposal in 2017 by then-Fine Gael leadership contender Leo Varadkar for a new social contract for Ireland. It also covered Donald Trump, climate change, Brexit, homelessness, inequality in the education system, plastic pollution, child labour, ethnic identity and gender issues. In one higher level essay choice, candidates were asked to discuss whether globalisation was breaking down national cultures and identities. As a stimulus, the question included a quote from U2's The Edge, stating that "one of the good things about globalisation is that is has created a single international, music community and I feel very much part of it". Teacher Brendan Green, a TUI subject representative of St Clare's Comprehensive School, Manorhamilton, Co Leitrim, gave the papers a welcome, but expressed surprise at the absence of a question on a referendum. Donal McCarthy, an ASTI subject representative and teacher at Presentation Secondary School, Wexford, said the overall impression was that higher level was "fair and balanced". However, in the short answer questions "there may have been some terms with which students were not familiar or were asked to summarise something complicated in a few lines". Meanwhile, Kevin Dunphy, an ASTI subject representative and teacher at Heywood Community School, Co Laois, described both physics papers as "fair, with good choice". Higher level students to whom he spoke said there were some "tricky bits" and "some tough parts". At ordinary level, Mr Dunphy said Section A questions three and four were theoretical, with no data or results given to work with, "something that students would have been used to while doing these experiments". In Section B, he thought question eight on light was challenging, although "the other questions were very nice". Seosamh Mac Cealuabhní, a TUI subject representative and teacher at Coláiste Ailigh, Letterkenny, Co Donegal, described the DCG higher level paper as "very favourable" and he had no quibble with ordinary level. 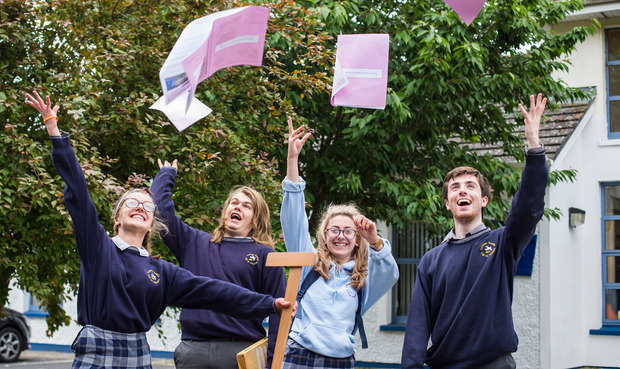 The Junior Cert wrapped up yesterday with music, technology, Jewish studies, Italian and Ancient Greek. Mary McFadden, an ASTI subject representative, who teaches at Loreto Secondary School, Balbriggan, Co Dublin, welcomed "the clarity of questions" on the music papers, which made it easier for the students to focus on what they were being asked.